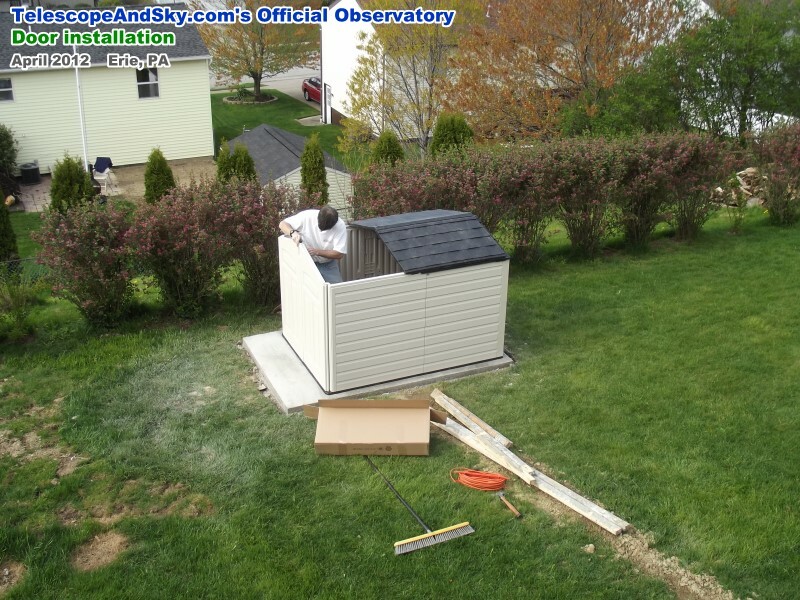 The official Telescope & Sky (that was the original name of my website) observatory is complete! First light for the entire setup was May 19, 2012. 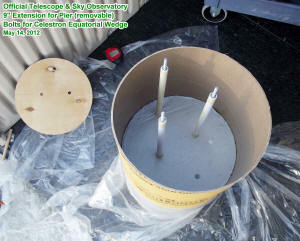 An alignment of the equatorial was performed, and then a GoTo alignment was done. The result was pretty good, but it's been better. I will need to take time to do a really precise alignment of both. It was a clear night in Erie, with a few high, wispy clouds. There was a lot of atmospheric unsteadiness, so image quality varied considerably. The JMI electric focuser is extremely nice; not having to touch the telescope during focusing makes a world of difference in how well the NexImage camera can be focused, especially under conditions where the image is being randomly distorted by the unsteady air. Maneuvering inside the shed is a bit tricky, but it is possible to get a comfortable viewing position for everything so far - with some position more comfortable than others. 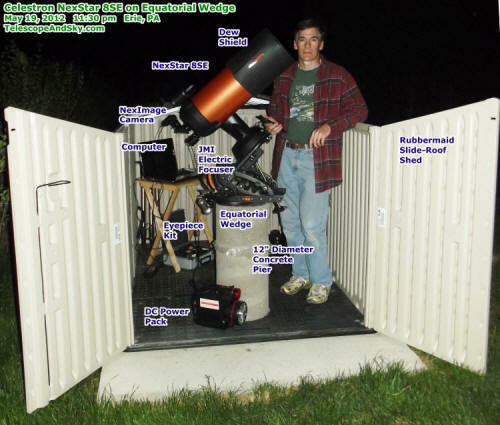 Total investment including telescope, building, and accessories (not including computer) is around $2,500 - it ain't cheap, and that is with fairly low-end equipment and buying used (eBay) where possible. In the picture (below) of the observatory, you will see a piece of plastic about 9" down from the top of the pier. 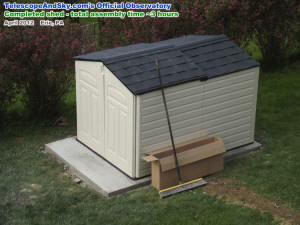 I needed to pour an extension to clear the top of the shed enough to have a good view to the east. 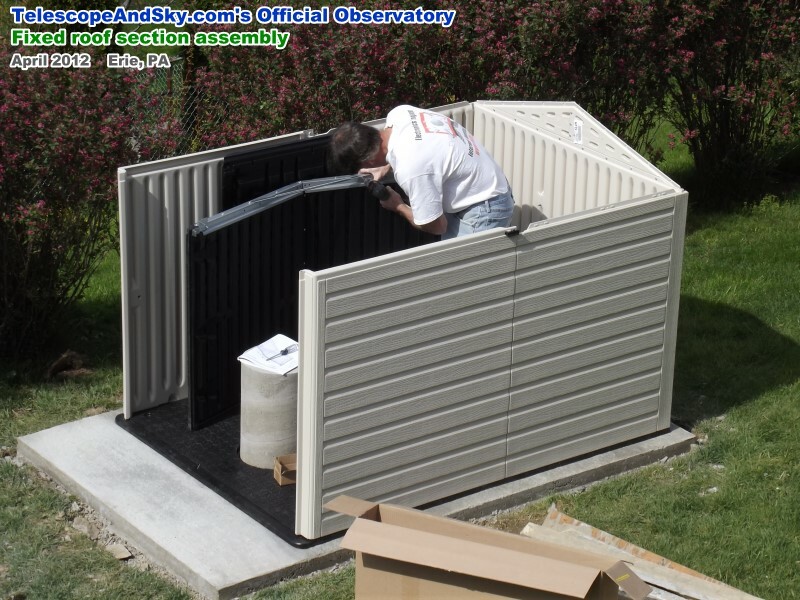 The plastic is a separator so that it is removable in case I get a new mount or new telescope someday and need a different overall pier height. 1/4-20 all-thread bolts run from the original base, up through paper tubes, so that the entire extension can be lifted off. 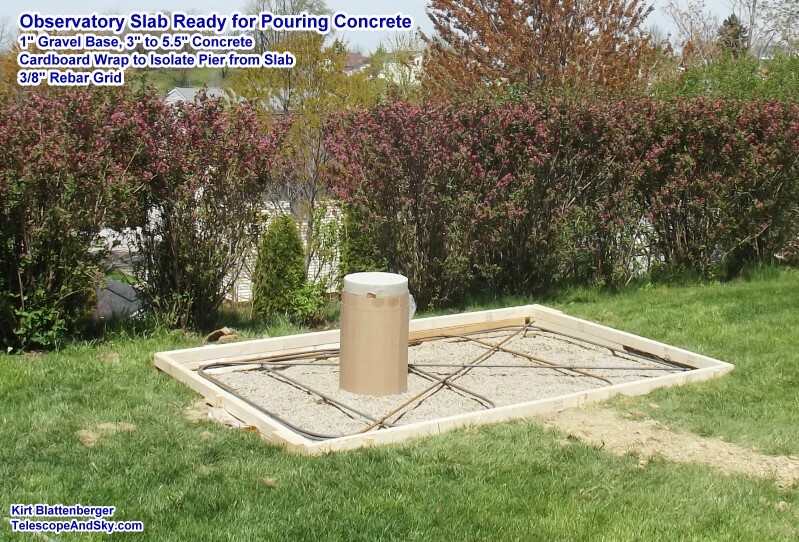 It took exactly one 80-lb bag of concrete to fill the 12"-diameter form. Voila! 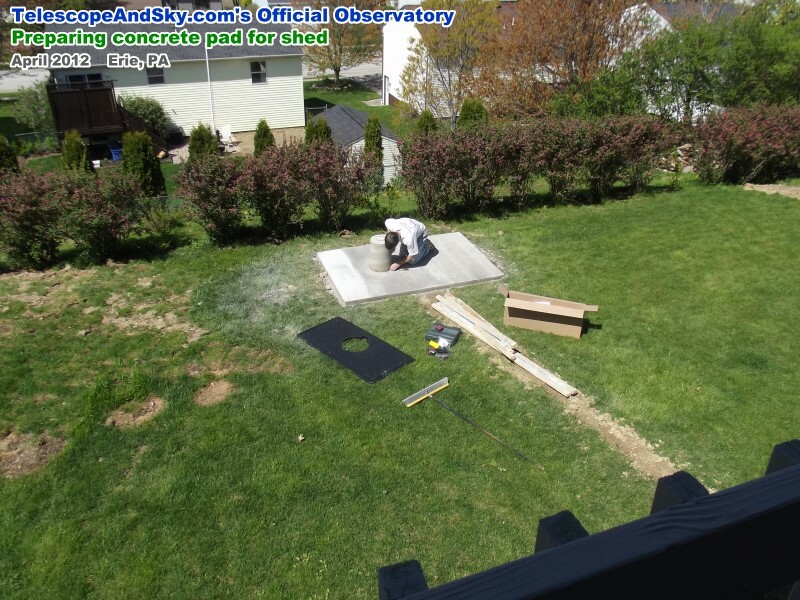 Here is the completed Telescope & Sky Observatory. Total investment: ~$2,500. (both excellent condition, saved ~$250 over buying new). I was planning to design and build a minimally-sized observatory structure with a rolling top, and then Melanie handed me a sales flyer from Sears that had this Rubbermaid® Resin Slide Lid Shed on sale. It seemed like it might fit my needs exactly. The dimensions even seemed to be perfect for the height of the pier that I had just poured. 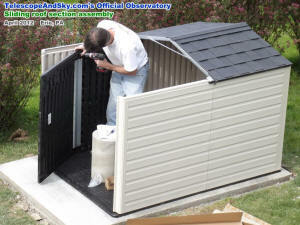 A search on the Internet showed that I was not the first to decide to convert one of these slide lid sheds into an observatory. 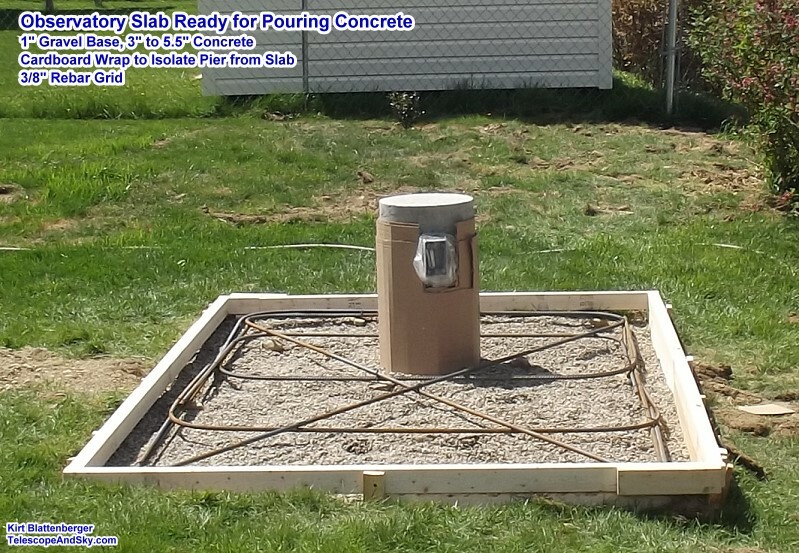 Among the nice features are an integral floor to keep it dry inside, the resin construction is strong and UV resistant, it goes together very easily in a short time, and it is not that much more expensive than building a decent one from scratch. I have built a lot of sheds and other structures in my lifetime, so being able to take the easy way out on this one is a welcome change from the cutting, screwing, nailing, priming, and painting. These construction photos are posted in reverse chronological order. To start at the beginning, please go to the bottom of the page and work you way back up. 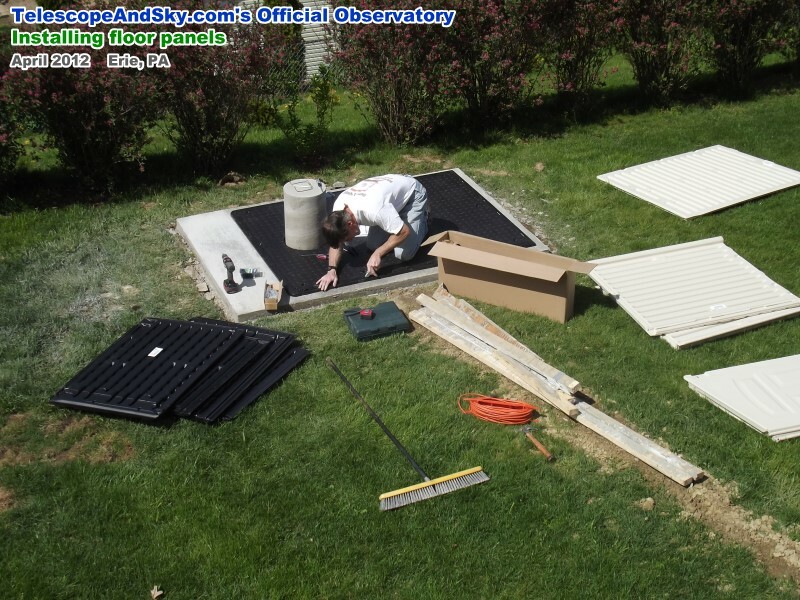 If you are interested in seeing the guts of a Celestron NexStar 8SE, please read my teardown report on it. 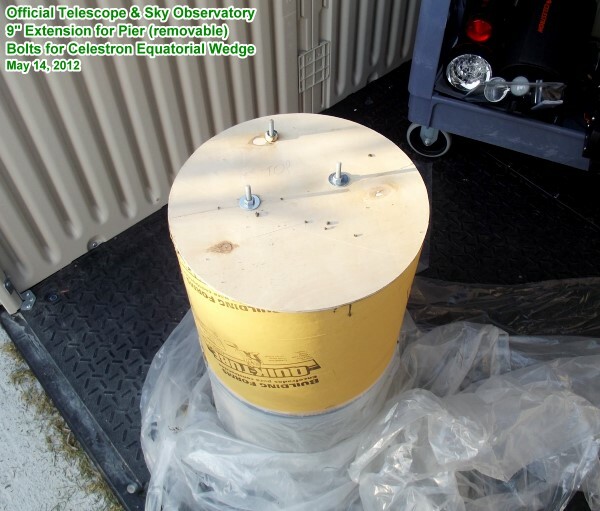 I also did a teardown report on the Celestron NexImage telescope camera. 1-mil plastic sheet was placed on top of original pier in order to make the extension removable. Three layers of notebook paper were wrapped around a 1/2" wooden dowel to form tubes to place around the 1/4-20 all-thread bolt extensions to allow concrete extension to be lifted off if necessary. 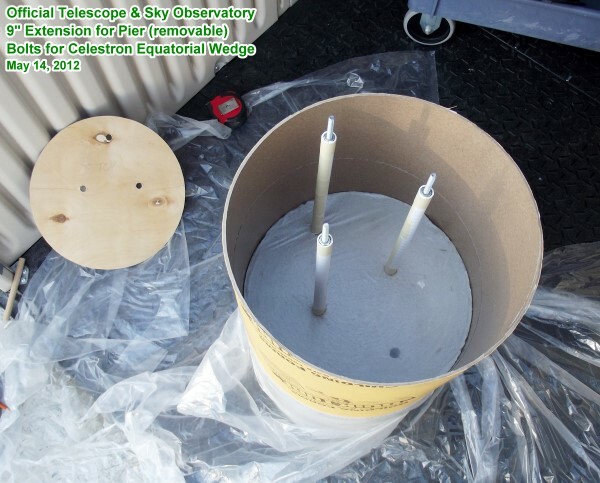 A 1/4" plywood template was made to locate the tops of the mounting bolts for the equatorial wedge. 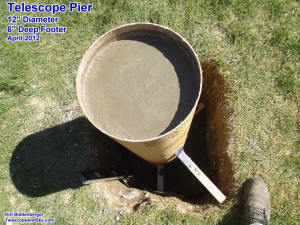 The 12"-diameter Quik-Tube form was a snug fit over the original pier, which is what is desired. Duct tape held the tube in place after using a straight edge to ensure that the tube was parallel to the original pier. An 80-pound bag of Quikrete fills 0.6 ft3. 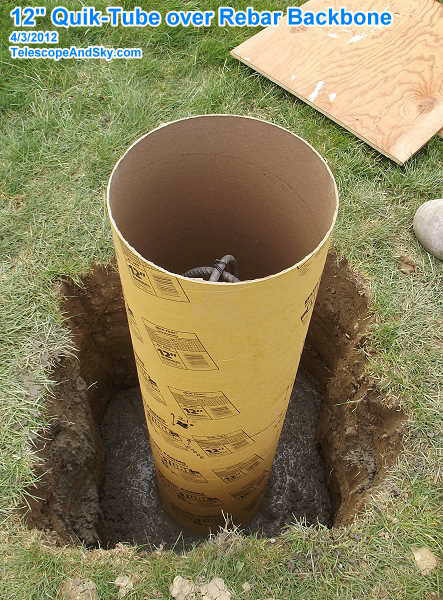 The Volume of a 12" diameter cylinder, 9" high is about 0.59 ft3. The single bag just barely filled the mold (actually about 1/8" low), so Quikrete is over-stating its capacity, especially since subtracting the Volume of the three bolt clearance tube makes the actual Volume even less. 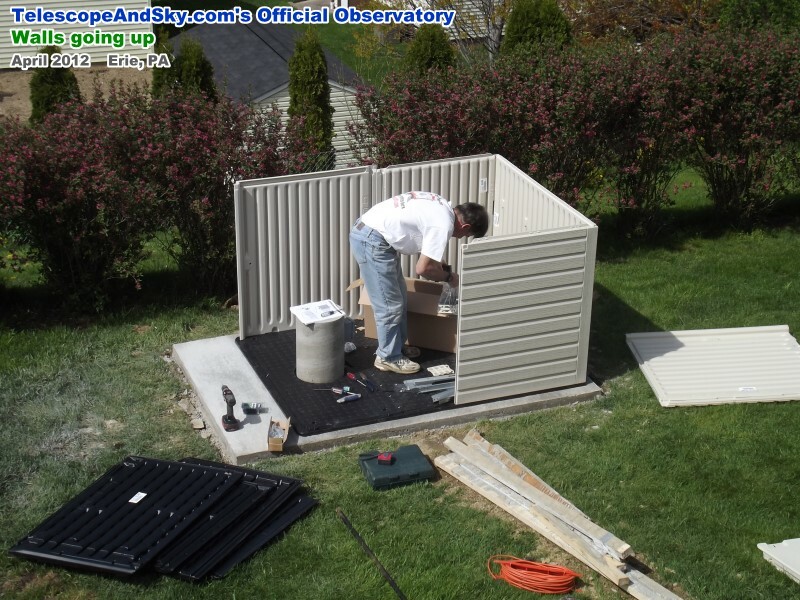 Rubbermaid Slide-Lid Shed Assembly - Door installation and completed shed! The final step was installing the two doors. A bar on the sliding roof with a hole in it for a lock pokes through a slot in the overlapping doors. I don't store the telescope or eyepieces outside, so there's nothing for a thief to gain after breaking in. The west side of Erie is a very safe area (the welfare crowd is on the east side) so I'm not too worried anyway. 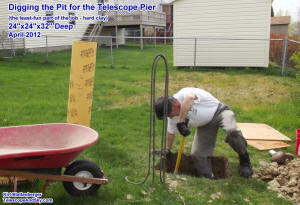 A clearance hole was cut in the floor panel to make way for the 12" pier. Concrete screws were used to secure the floor to the pad. Wooden frame for concrete pad w/rebar framework (3½" min to 5½" max). The pier was wrapped in 4 layers of corrugated cardboard for isolation from concrete pad. After the concrete hardened, the cardboard was removed and sidewalk crack caulking was applied between the pad and the pier. 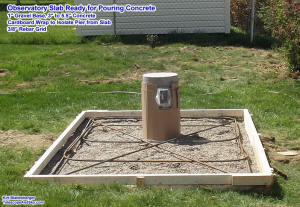 120 vac weatherproof GFIC receptacle box was installed along with an underground feeder inside 1/2" PVC pipe. Digging the pit for the pier footer post. A 24" wide square hole was dug 32" deep for the concrete pier footer and column. 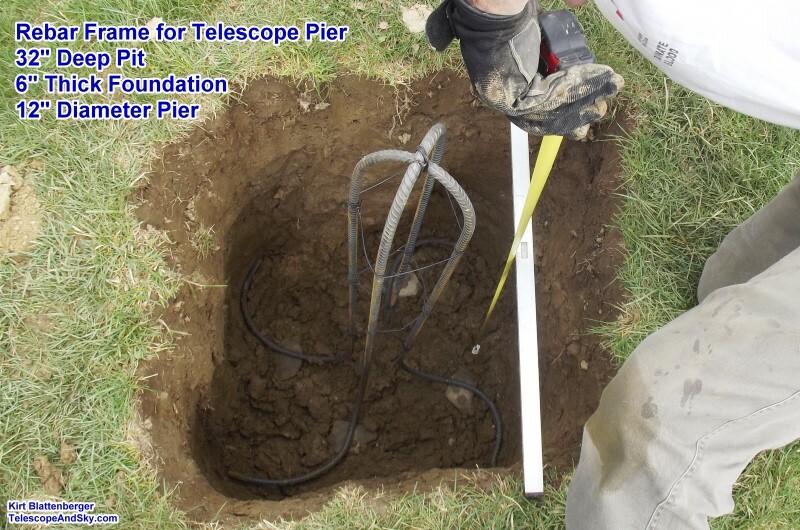 3/8" rebar was bent and wired to ensure maximum strength and resistance from cracking due to the ground freezing and thawing.